This 12 cm (4.7 inch) Round Allied Grid-Lock™ Plastic Embroidery Hoop is compatible with many Brother PR Series & compatible home embroidery machines with extended distance pantograph arms. Allied hoops for Baby-Lock and Brother Home embroidery machines are made to fit the 504 mm (approx 19.75 inch) Extra Large Arm Spacing. This enables the maximum embroidery area on the machine of 200 mm (7.9 inch) in the Y-direction and 300 mm (11.8 inch) in the X-direction and therefore the user can utilize Allied hoops to their maximum capability. Because the embroidery area is sometimes larger than a particular hoop can allow, always do a trace before starting the embroidery job to ensure that the needles and presser foot do not come in contact with the hoop. Always keep a minimum of 1/2" gap between the design and the inside wall of the inner hoop. This hoop is a "Double Height" hoop which measures approximately 3/4" thick. The extra thickness provides additional gripping surface area compared to "Single Height" hoops and therefore is the ideal choice for thicker fabrics and also slippery fabrics such as satins and silks. 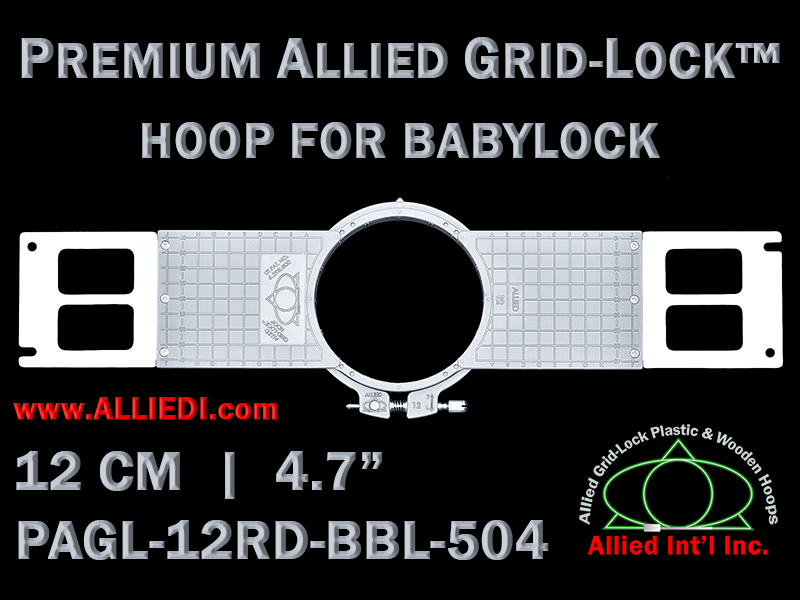 Premium Allied GridLock Brother (PR Series) Hoop 6.5" x 7.0"